We have snow! Lots of it! It has been snowing for a while, but not until about a week ago was I able to take out my skis. Though it turned out to be a little early, and the skis have payed the price. The dogs love it. And it is a great way to tire them out and build muscle. Bajnok, it turns out, is in excellent shape. Better than I’d hoped. He will pull and keep pulling, and nothing will show that he is getting tired. Derria is a healthy dog. She just needs to build some muscle. She will pull and give it her all for quite a while, but she will get tired and eventually her trot turns into a pace. That’s when I let her off lead and she gets to run all the way home. One of our trips was to watch the lunar eclipse. I brought wood to make a bonfire, hot dogs, drink and was ready to watch something spectacular. 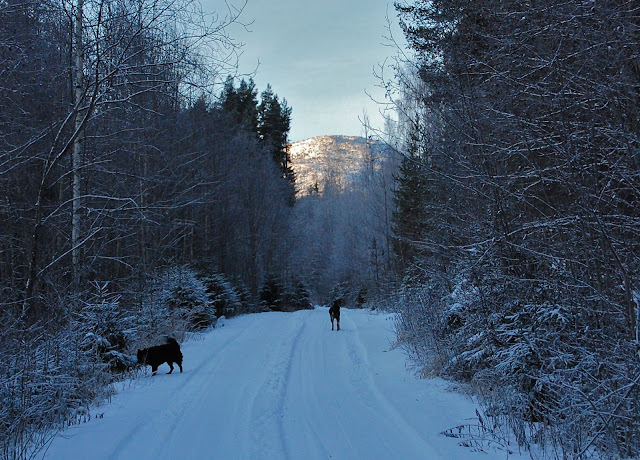 We had an enjoyable evening, I got the bonfire going and the dogs were wooshing about the woods in -16 celsius, but it was too light and a little clouded over the mountains, so I didn’t see the eclipse itself. Saw a fantastic return though. No pictures of it, unfortunantly, but enjoy a picture of a hot dog on the bonfire. That was the last ski trip until today. It was very hard not putting on the skis when I headed out in the last few days, but I managed it. Today the dogs were happy to pull again. We tried going a new place today. A tractor had driven there, so there wasn’t heavy thick snow to get through, but rather tractor tracks to stick to. 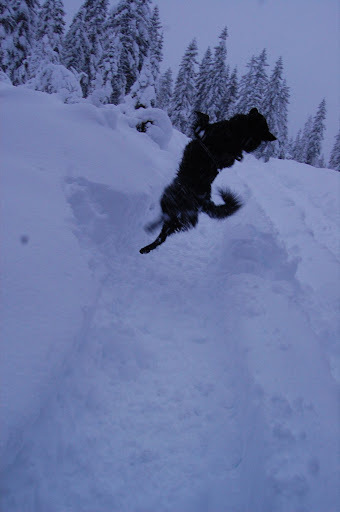 There were hills and no oportunity to put the skis in fish bone, but the dogs were pulling hard, so up we went. It was fun to watch Derria and Bajnok really digging into it. They stopped when I stopped at times, which ment me dangling on the edge and almost sliding backwards, but they soon understood that tension is the key. After they got that, it was smooth sailing. We climbed for a while before we took a break and I took something to drink. The dogs ran around, or rather, Bajnok ran around whilst Derria stood still. That dog has some strange things about her. As she understood that we weren’t moving just yet, she to started to move about. Bajnok adores winter and snow. Something sparks a devil in him and he turns into a little idiot. I love him for it, even though it is a little annoying. It really was amazing up there. Not the best picture weather, but we got some photos. Some of which I really liked. After a short photo session it was time to head home. Since it was all downhill, both dogs were off lead. I wanted to focus on my feet, seeing as I had barely enough room for my skis. Now, in these tractor tracks on skis downhill, I had no way of doing anything about my speed. No way of braking or ploughing. When I sream “Watch out” I expect the dogs to move out of the way. For the first part of our time moving down, Derria was well ahead of me and Bajnok. She sprinted along and had fun. Bajnok ran along side me, and in front of me, and sometimes followed Derria. He’s fast that little boy, you see. When I tell him “Watch out”, he looks behind himself, weaves to the side, and places himself behind me. Very clever lad. I fell a few times. The dogs were well in front by that time, but they turned back and Bajnok came with his tongue in my face every time I fell. However, when I was starting to get the hang of this, the fact that I had no brakes, Derria was starting to get really tired. She was no longer sprinting ahead. She was starting run with us, and straight in front of me. In the same track. She would sprint a little bit, then slow down to a trot. This is when I would catch up with her. I told her to get out of the way, and she did a couple of times. She then at one point jumped tracks in to my track, so I had to fall to stop and not crash into her. That’s when my knee got bruised. I landed on a rock under the snow. Not two minutes later I was feeling very good about myself, skiing down a bumpy hill, still standing and keeping my balance when Derria comes trotting towards me. I try to tell her “watch out”, but it ends with me on my arse and with a severely bruised pinkie. It is hard to use my mobile because of that. I then took off my skis and walked the rest of the way down. That dog does not know the command “watch out”, somebody needs to teach it to her. Oh, right. That would be me. When we got down to the road I put them back on pulling duty. They kept working all the way home. Beautiful pictures. I have been to Finland in the winter one of my favourite trips! Oh, I bet Finland is gorgeous this time of year!